SSND rule book from Milwaukee, 1925. The School Sisters of Notre Dame’s earliest days in the United States are rooted in Baltimore, Maryland, and the heritage room at Villa Assumpta reflects that deep history. In 1847, Blessed Theresa Gerhardinger, foundress of the School Sisters of Notre Dame, traveled to Pennsylvania and then to Baltimore where she was helped by St. John Neumann. Through his efforts, the School Sisters of Notre Dame gained a foothold in Baltimore where they began teaching in three German parish schools in October 1847. 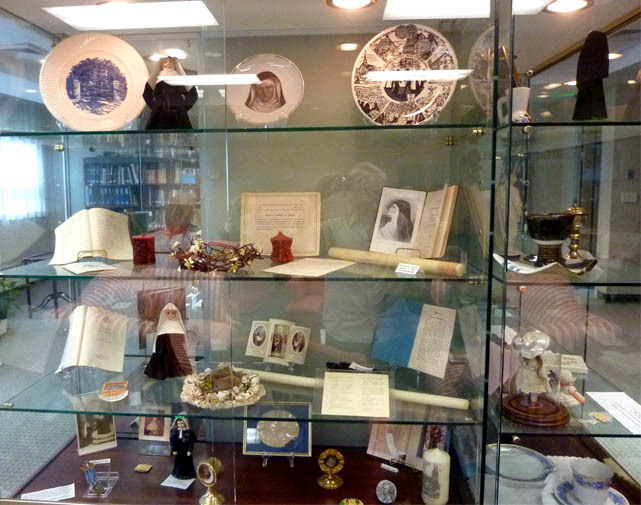 The heritage room at Villa Assumpta includes artifacts dating back to this period, including the passport belonging to Mother Caroline and an 1847 medal from Institute of Notre Dame, the SSND’s first school in the United States. Plate with Notre Dame of Maryland Arch, which was once located at the beginning of the road leading up to what was then the College of Notre Dame – now Notre Dame of Maryland University. The arch is now located on the grounds of Notre Dame Preparatory School in Towson, Maryland. Doll in the original habit of SSND and plate with picture of Blessed Theresa Gerhardinger, SSND foundress. Plate showing the role of the Redemptorists Fathers in St. Mary’s, Pennsylvania. In the center, St. John Neumann is baptizing Xavier Sosenheimer, 1844. 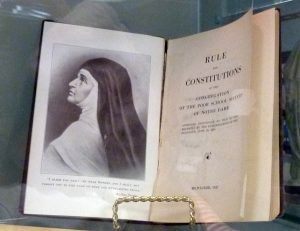 SSND Investiture book, crown of thorns, candle and Rule and Constitution (Milwaukee, 1925), which were given to sisters at their final vows. Ceremonies of Investiture book from 1936 containing prayers for women entering the congregation. Medal of Pope Pius IX, which touched his coffin, 1878. Pope Pius IX approved the Rule and Constitution of SSND. Crown of flowers with a lock of hair. Crown and rosary were given to novices when they were received into SSND. Prayer card of Blessed Alix Le Clerc and relics of Father Francis Sebastian Job, St. Peter Fourier, and Blessed Theresa Gerhardinger. Doll depicting an SSND postulant. Candle from Regensburg, Germany, birthplace of Blessed Theresa. See more images of the Baltimore, Maryland location on our Pinterest page.